Every night hundreds of thousands of South Australia’s head home after a day at work or school to the warm comfort of their home, but for many this is not the case. During Homeless Awareness Week we are supporting the vital work of the Hutt Street Centre, by donating a weeks worth of meals to the homeless of South Australia. Our staff are also donating their time to assist in the kitchens and serve breakfast and lunch. The Hutt St Centre is a place of hope and opportunity, helping people facing homelessness to rebuild their lives. The Hutt St Centre meet people who are doing it tough for many and varied reasons. The loss of work, family breakdown, grief, mental health concerns, addictions domestic violence and many other issues. Having a meal at the Hutt St centre is often the first step for people seeking support to overcome the personal and social issues that may impact their lives. A warm meal at the centre not gives a person experiencing homelessness a nutritious meal but enables the staff of the centre to engage with that person to start rebuilding their life. 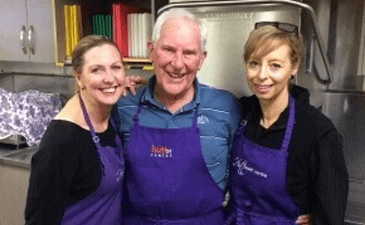 We know that our support goes so much further than providing food, a meal at Hutt St Centre gives dignity, respect and companionship to people who are struggling and can be the first step to rebuilding a better life.